From Lu’s lips to your screen: this is one of your top 5 best dishes. He also said this after plate #1, #2 and #3. On Friday, two of my lifelong best girl friends came over to make vision boards. 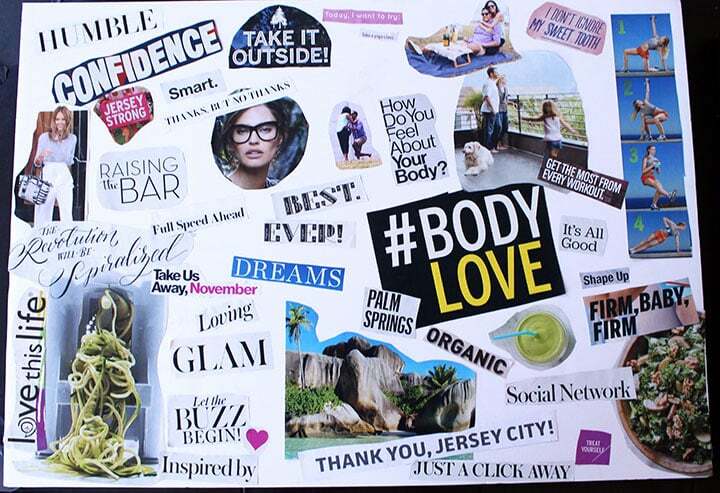 For those of you who aren’t familiar, a vision board is basically a collage of images, phrases and words placed on a piece of paper, cardboard, foam board or any type of canvas. This imagery is supposed to capture your vision – to represent you and your goals. I believe Lu. This is definitely one of my top 5 best dishes. It’s pretty incredible how much this tastes like lasagna. 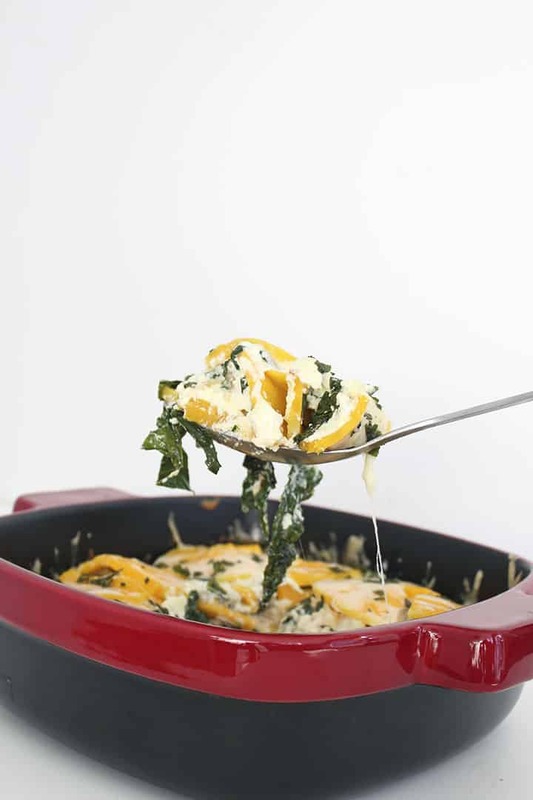 The Blade A-cut butternut squash creates a pasta-like consistency with the butternut squash. These butternut squash layers take the place of the lasagna noodles. Earlier this year, I made a spiralized zucchini lasagna with spinach and tomato sauce – a classic. Now, I’m “winterizing” this lasagna by using a winter squash, a winter lettuce (kale) and of course, a heartier filling: sausage. You can eat two or three servings of this and not need a nap, I promise. Of course, you don’t need to eat more than one serving – it’s filling in the most healthy way possible. 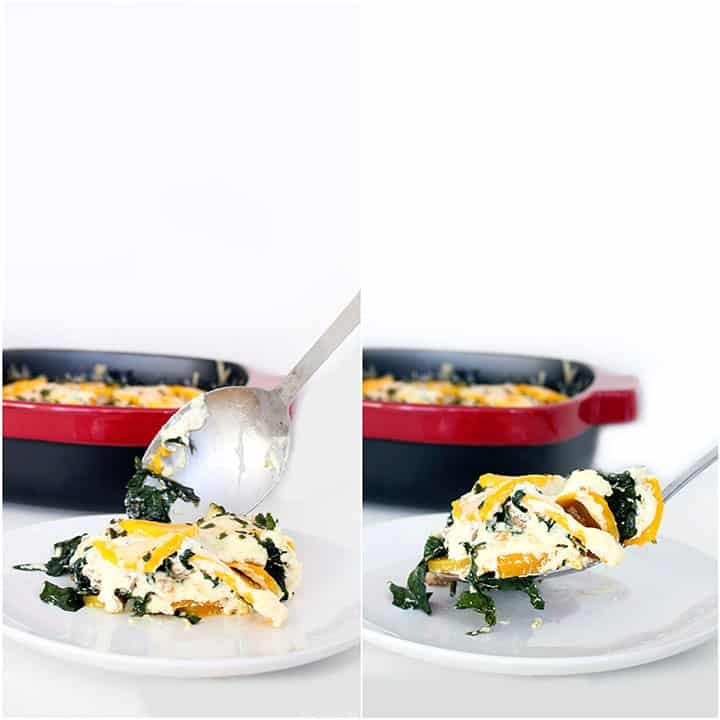 The ricotta stuffing is fluffy and creamy, creating that quintessential lasagna texture. The sweetness in the butternut squash noodles pairs immaculately with the sweet Italian sausage. The kale adds its superfood nutrients and a lovely green color. This is probably the most colorful lasagna out there! This lasagna is something that reheats very well. It’s ideal for Sunday meal prep – make a batch of this and put it in the fridge to last all week. It can be frozen and reheated, as well. You can double the recipe, also, if you have a larger baking dish. 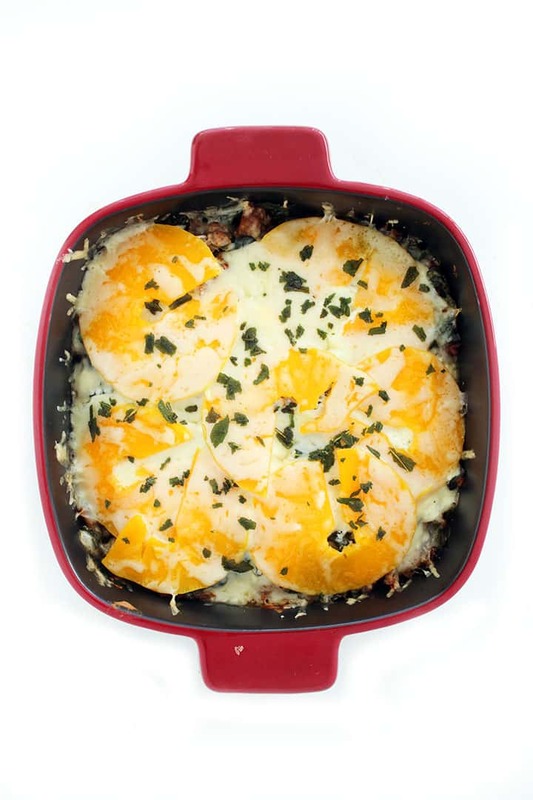 Then, you just cover with foil, bake for 40-45 minutes and voila – you’ve got yourself a spiralized winterized lasagna! Now, for my vision board. It’s still a work in progress, but you can tell what my vision is, right? It’s lacking some bridal pictures – I bought a Brides magazine on Sunday and I’m going to add a few clippings this week. What do you think? If you missed it, last week, I shared my weight loss journey story. In support of my fit journey, Under Armour is giving away one lucky Inspiralized reader a Women’s StudioLux Duffle bag, valued at $134.99. Open to US addresses only, giveaway will end Thursday, October 30, 2014. Good luck and thanks to Under Armour for making me look good while I sweat! Cut the bulbous bottom off the butternut squash (the seeded part.) Slice the top off to ensure that it’s perfectly flat. Peel the butternut squash entirely. If the butternut squash is longer than 6 inches, slice it into two manageable pieces. Slice halfway through the butternut squash, just to the center (careful not to go further.) Spiralize the squash, using Blade A. Place a large skillet over medium heat and add in the olive oil. Once oil heats, add in the sage leaves and cook until crispy, careful not to burn. Transfer the sage leaves to a small paper towel lined plate and set aside. Immediately crumble in the sausage to the skillet and cook until browned, 5-7 minutes. Then, add in the kale, garlic, red pepper flakes, shallots and season with salt and pepper. Cook the mixture for 2-3 minutes or until kale is wilted. While the sausage is cooking, add the ricotta, parmesan and egg to a bowl. Whisk together and set aside. Once the sausage is done, gather all of your prepared ingredients. Take out a casserole dish (I use 4.2 quart) and add a layer of the butternut squash to the bottom. Then, add a layer of the kale and sausage mixture. Then, add in a layer of ricotta mixture. Top with a layer of butternut squash. Then, add a layer of the kale and sausage mixture. Then, add in a layer of ricotta mixture. 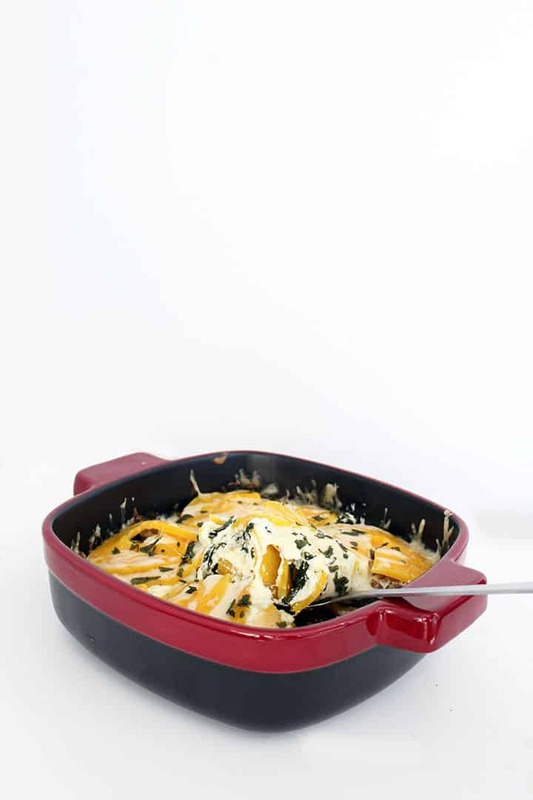 Top with a layer of the butternut squash and then, top with all of the gruyere cheese. Cover the casserole dish with tinfoil and bake in the oven for 40-45 minutes. After 40 minutes, poke the top layer and if you can easily pierce through the butternut squash, it’s done. If you can’t, bake another 5 minutes. After the 40 minutes of baking, take the dish out of the oven, remove the tinfoil top and immediately sprinkle with sage topping. Then, let rest for 5 minutes. 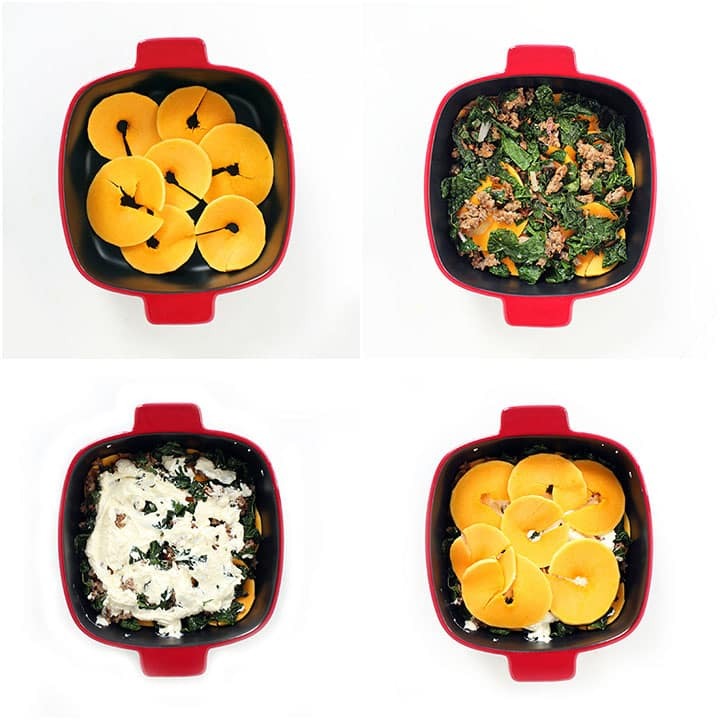 After resting, carefully cut the lasagna into 6 equal portions. I love this recipe! Low carbs+real food=best case! My husband has been loving your recipes- this looks like a winner as well! Ali, this looks so delicious! Kale is often impossible for me to find here in Berlin - do you think I could use fresh spinach instead? Yes, that would be okay! This dish is amazing! I did sub fresh spinach and it worked great. I wish I would have used more though. It cooks down so much. Meaghan, how much spinach did you use and how much would you suggest using based on your results? Thanks. Amanda, for some reason I can't reply directly to you....anyway, I used a double layer, completely covering the dish (sorry, didn't measure). I would probably use twice that -- so, like four layers on each section. Oh, and I didn't pre-cook the spinach because baking it was enough. I layered it raw. Yes, and I'd love to see what your workouts are! This looks so yummy. Can't wait to make vegetarian and vegan versions. Looks amazing. I will have to try this this weekend. I would be very interested in following your progress. You were very brave to share your story in order to help others. Yes, I would be interested! Looks delicious. Hi Ali, Sounds delicious! any recommendations for vegetarians? maybe white beans instead of sausage? Thanks!! Crumbled tempeh is my go-to for crumbled/ground meats! I found a recipe for crumbled tempeh sausage so I'm going to try that! I'm not sure if it's good etiquette to link to another blog but if you google tempeh sausage you'll find some recipes :) Basically boil tempeh for ~15 mins then saute with spices. Quinoa would be a great substitute, perhaps with some crushed almonds for more heartiness! Jessica what kind of quinoa did you use? I would love a friday post! I am a little confused -- do you spiralize both the seedless top and the bulbous bottom ( minus the seeds) of the squash, or just the top? Check out my YouTube.com/GetInspiralized page - I think it will help with this! The recipe looks wonderful, but I'm wondering what kind and flavor of sausage you do you suggest? Good 'ole sweet Italian sausage! Ohhhh YES! I can taste this already! Another CAN'T WAIT!!! Tx! Looks great, just wish I had some kale left! Looks amazing! 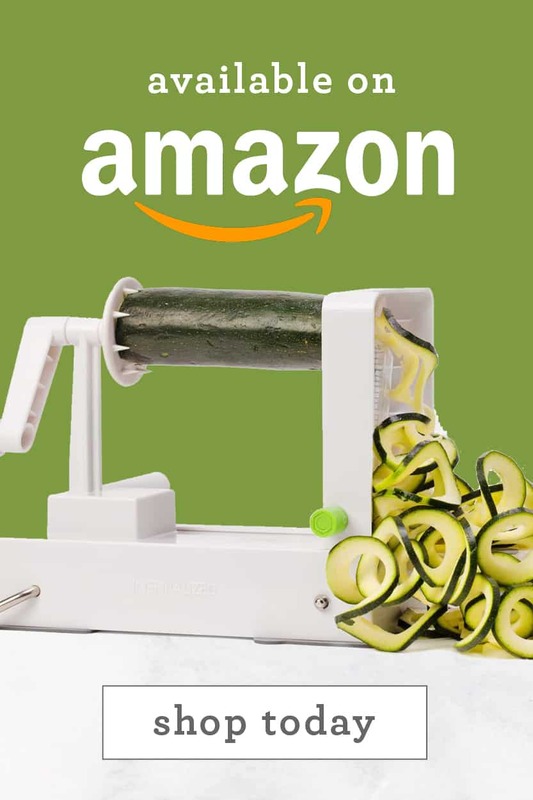 Your blog is reinforcing my desire for a spiralizer. I like your idea for Fridays. This looks amazing! And have been seriously craving lasagna. 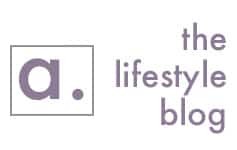 Any tips for paleo eaters who don't consume dairy? I was thinking of adding some cashew-cheese but maybe you have a better idea? Oh my god please keep he butternut squash recipes coming I'm making them all- made your noodle tacos today! This is on the list for this weekend thank you! Can't wait to try this! Good luck with your health and fitness journey. I lost 100 lbs and have kept it off for going on 4 years. If I can do it, anyone can. Can't wait to try it. I will be making this today for us and a batch for my daughter and son in law. It is a very pretty dish! What a lovely side dish for a thanksgiving! I love butternut squash! You're always so creative! Thanks!!! This looks so good but I don't eat cheese. What can you suggest I could use instead? This looks amazing. I don't mind the fitness feature idea, but maybe monthly instead of weekly. This looks incredible! 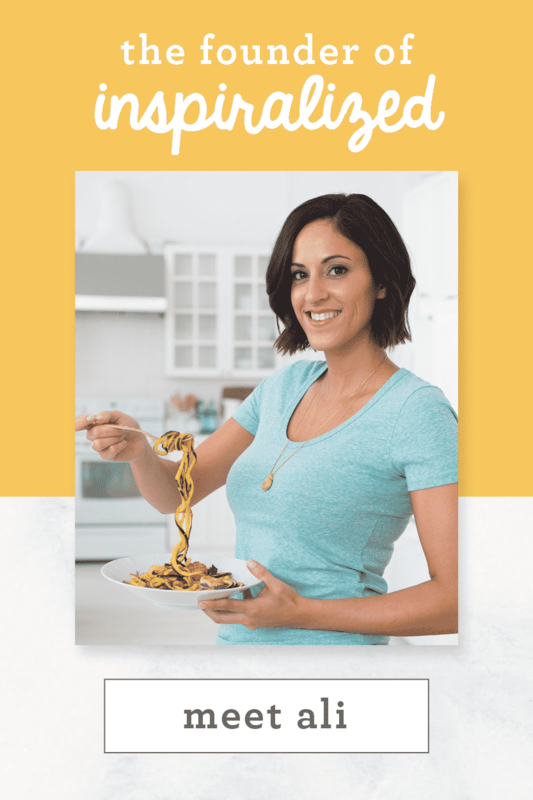 I recently bought my own spiralizer after reading your blog for months and I'm loving making all of your recipes! Thanks so much for all the inspiration! Ali, I need a cheese substitute for this recipe. Help please. Thanks. MaryAnn, you can try any vegan substitutes, such as cashew cheese. Or, you can use silken tofu alternatives. Hope that helps. We would agree with Lu, this dish is seriously good....we kept going back for "just a little more". Thank you. I can't wait to try this recipe! Planning on making it for friends on Sunday evening - perfect day for a lasagna. Now if it was only colder in Texas so I could have the full effect of eating a "winter" lasagna!! I found the butternut squash almost impossible to spiralize. I watched the tutorial and did it the same way, so it wasn't user error. I couldn't even stick the back portion into the squash to grip it, so had to twist it by hand. Do you think the squash just wasn't ripe enough? If so, any tips for picking out a riper squash? Thanks! Lauryn, I was searching the comments for this recipe because I had the EXACT SAME PROBLEM. I would have typed exactly what you said had I not come across your comment. I even sliced my finger as I was twisting it by hand :( I didn't know you could buy more/less ripe butternut squash. I'm wondering if this is the issue. My pieces also turned out fairly thick, I'm hoping this is OK as I am not baking my lasagna until tonight. Ali---Do you have any insight and/or suggestions for us? Hmm. Perhaps your butternut squash is too large and unmanageable. 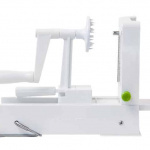 Or, what type of spiralizer do you have/where did you purchase it? Feel free to send me an email so we can discuss! I have the Paderno spiralizer and found it nearly impossible to use blade C with a butternut squash. However, blade A works just fine! The first time I made this, I cut the squash like Ali says to in the recipe, but that resulted in uneven pieces (and uneven cooking). The second time, I spiralized as normal and cut them afterwards. Worked like a charm! The "noodles" were even in thickness and thus cooked more uniformly. Not sure what's going on with blade C though...I love my butternut squash noodles! I long try to find a recipe that has butternut squash because I cook for my 14mo old and I want to spice it up a liitle rather than offering it only baked and I have to say congratulations! The combo zucchini-butternut-spinach in my case worked fabulously! Definately aggree with Lu! I love this recipe! It was so delicious and healthy! My husband even told all his friends about the amazing dinner I made him :) thanks for this great recipe! "This is REALLY good," said DH. I didn't have kale on hand, so I subbed a 10-oz package of baby spinach leaves. I looked for gruyere at the little grocery store, but no joy, not even in the deli section where they usually have it, so I used the Western Family Italian mix shredded cheese. Excellent! We love your recipes, Ally! Made this tonight and it was fantastic! What are Lu's other 4 favorites? I think Lu and my husband have the same taste. Lu is right this dish is amazing! Glad it turned out well, Bob! If you want to freeze this do you freeze before or after baking? First time writer :). Ali - your skills are so impressive. I've been trying to find ways to get my toddler to more eat veggies and this dish was a hit! She asked for a second helping! I've gifted the spiralizer more times than I can count and plan to give several for the holidays this year. 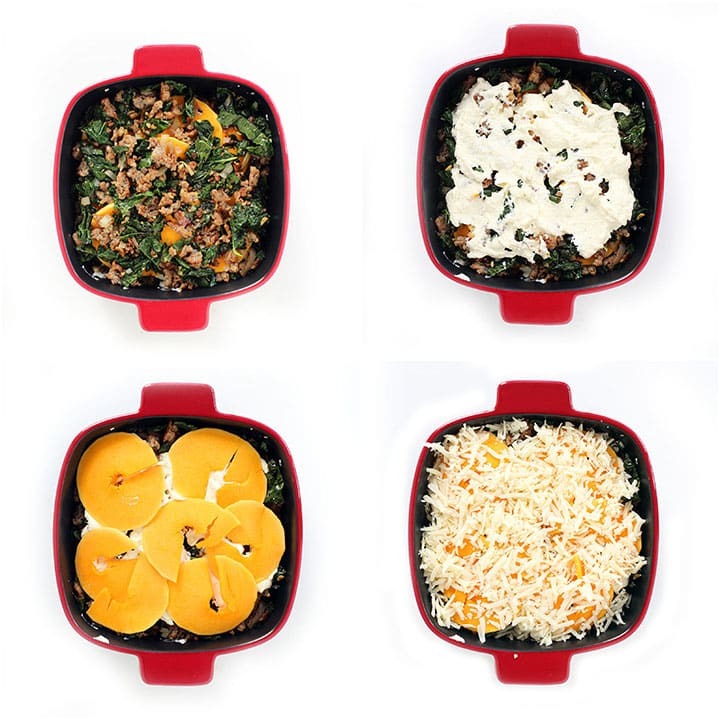 It makes eating healthy fun. Thanks for all the great ideas and congrats on your perseverance and dedication to your weight loss journey. Ali, I came across another users comment and had the exact same problem when spiralizing my butternut squash. I had to hand twist the squash, my pieces kept getting stuck in the blade because they were too thick to fold when I was twisting and what pieces I did come out with were quite thick. Do you think this was a result of the butternut squash not being ripe enough or do you have any other suggestions? Thank you! I made this last night and it was perfect! Everyone absolutely loved it. Thank you. This was my very first Inspiralized recipe--I made it the day my spiralizer arrived in the mail about a week ago. So delicious. It was also the first time I've ever fried sage leaves! (Note to self: draining on paper towels is absolutely necessary for crispness!) I spiralized a few smallish butternut squash and used the nice slices for the lasagna; I used the scraps and cores and ugly slices for soup the next day (with more fried sage!). I omitted the red pepper flakes and used hot Italian sausage instead of sweet. I also upped the kale, because kale. A wonderful dish that I would gladly take to a potluck or share with company. My husband loved it too. The only thing I wasn't sure about is the oven temperature...425 degrees seemed really high, so I cooked it at 375 with fine results. 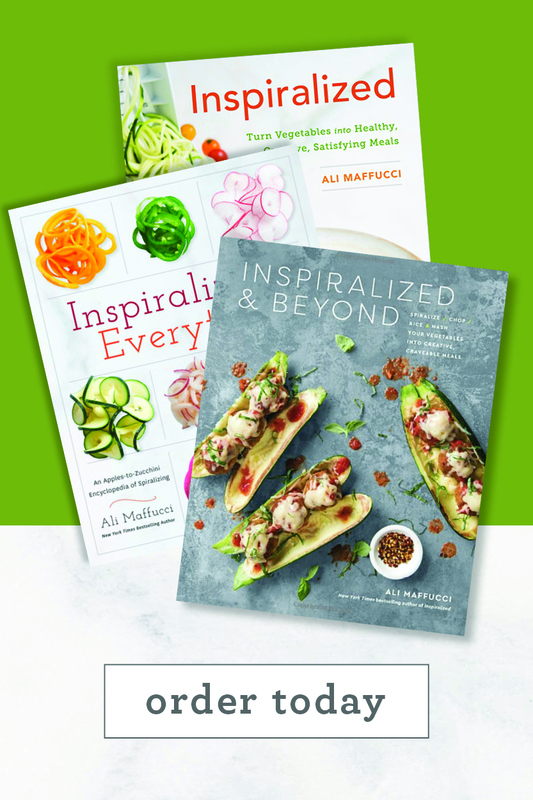 I'm excited to cook my way through your blog and book! I have seriously made this recipe 3 times in the past 10 days!!! This is my favorite spiralized recipe to date... and my fiancé totally agrees!!! This is my first major recipe with my Spiralizer. THANK YOU Ali, for this stupendous concoction! I love lasagna, and any major carb meal that involves cheese, and this was absolutely amazing! 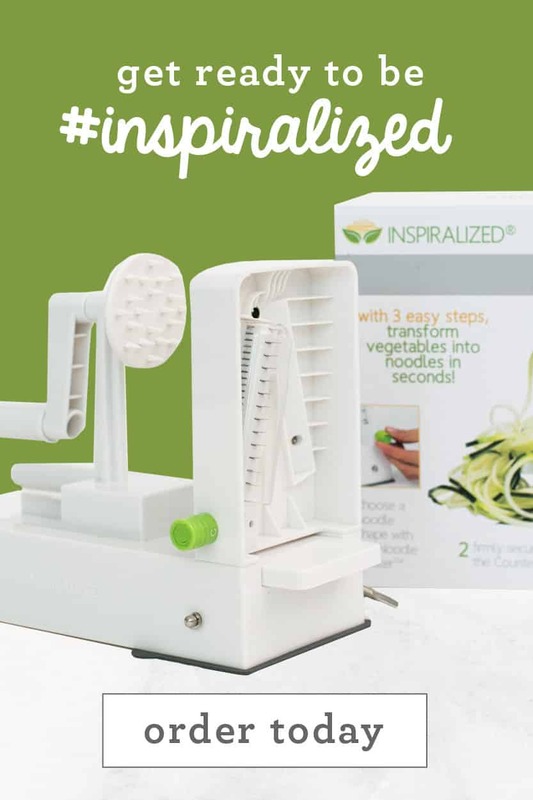 I wish I'd purchased the 4 blade Inspiralizer so that I'd know what your blade A, B, C, and D are, but I'm figuring things out on my 3 blade Spiralizer thanks to your descriptions. Being a cheese addict, I will confess I doubled the ricotta and the sausage/kale mixture as well. I think my squash was much too large - I still have more slices left over for another lasagna tomorrow!! I rate this a 10 thumbs up! PERFECT and I could use this for entertaining as well! SLURP. Off to have more now! Ali, I made this recipe tonight exactly as written. It is probably the most delicious dinner I have had in years including those from 5 star restaurants. I was worried about spiralizing the squash. I had to shop down the cheese and paid $10 for the Swiss version. Again, the best. Well worth the time and prep. Thank You, I'm blown away by how tasty vegies can be. I would rather have this than pasta lasagna. I was scouring these comments in hopes of a dairy free option! Do you have a good recipe for cashew cheese? We're so glad you loved the recipe, Amber! Has anyone tried this recipe without the sausage to make it vegetarian? This recipe is bomb but I have several family members who are vegetarian and would like to change it up for family gatherings. I've made it with vegetarian sausage or flavored Tempe. It worked great! 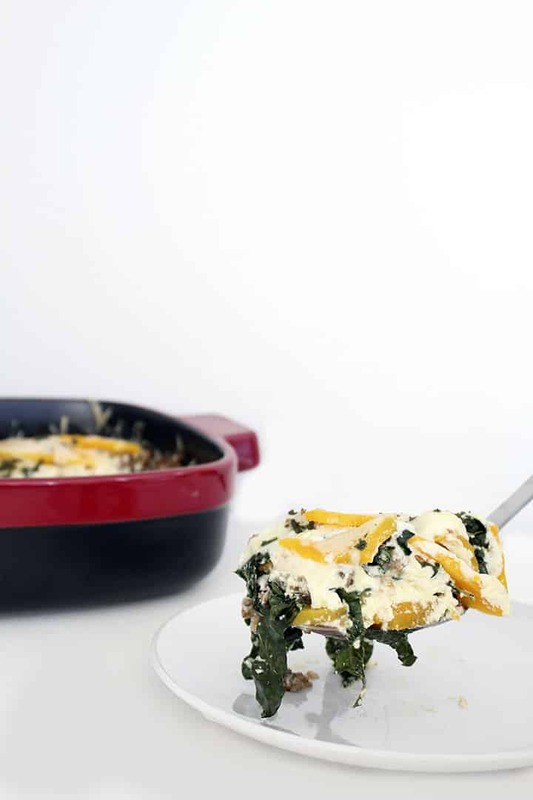 Just found this recipe while looking to make the butternut squash, kale, and sausage lasagna at Houlihans. I'm so happy to have found one that looks almost the same! Its so wonderful! I can't wait to make yours. Thanks again! I have and it was fine! Hi. 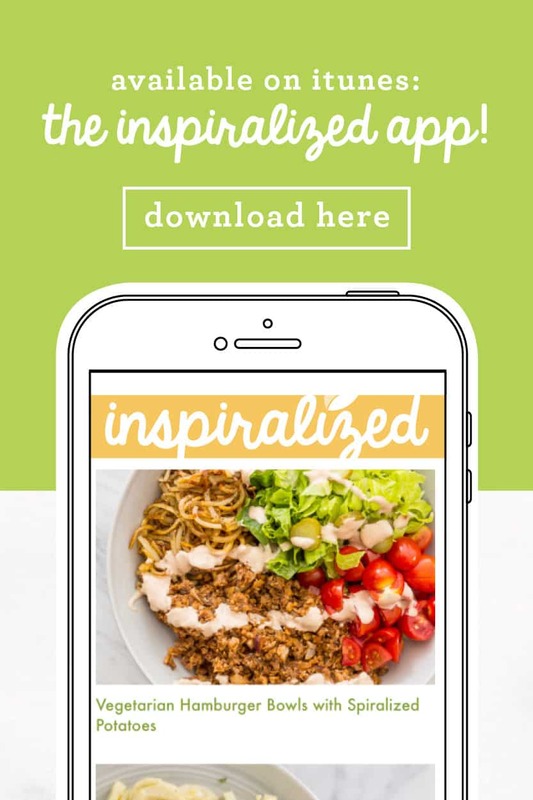 Love your blog and love the Inspiralizer! I'm making this recipe now and am having serious difficulty spiralizing the squash. I cut the squash in half as specified. When I go to spiralize, it works for a second and then the blade stops catching the squash. It just spins and nothing happens. I must be doing something wrong? Thanks! Hi Erin, make sure your poke end is firmly poked in your squash otherwise it will spin on its own. Try trimming the end that was poked into and redoing it. It needs to be firmly in place! Very good recipe. I will definitely make it again. I made exactly as the recipe stated and it was delicious. I made two, froze one. Thanks for the recipe! I made this tonight and it was amazing. Of course, it's thursday, so the house is low on ingredients: ricotta was sour so I used greek yogurt instead, didnt have fresh sage, had leftover kombocha and butternut squash so it was a mixture of the two. Despite all this, it came out amazing. So delicious and Im sure if I made it exactly as is, it would be even better (I love crispy sage!). Cant wait to do it again. I will say, the gruyere is essential because that flavor on top is just amazing. Thanks Ali! That's so fabulous! Great thinking. We're so glad you enjoyed the dish! Just made this tonight after buying ingredients several times and just eating the sausage plain cause I was hungry. Two things: 1. I could spiralize the first 1/2 of the squash ok, but then it wouldn't go thru. I jammed the prongs deep into it and then the little crank threatened to break, so I sliced the rest. Not sure what happened. 2. My husband ate it. Yup. A Keeper. 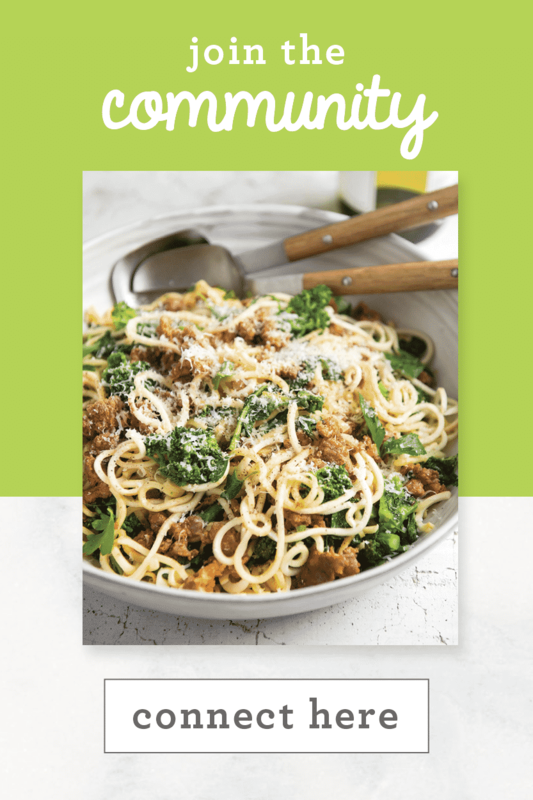 Just got my spiralizer and can't wait to try this dish! It sounds a lot like another butternut recipe I love, but this is much more nutritious. I'll probably swap the kale for escarole (to make it a bit more like my other recipe) but otherwise sounds amazing! Hoping to try it this weekend. Anyone know what the Weight Watchers points are for one serving? Thanks! My parents gave my husband and I an Oxo spiralizer and your Inspriralized cookbook last Christmas. We have loved every recipe that I've made from it so far. This lasagna was an overwhelming winner with us. I couldn't believe how filling it was but did not contain nearly the amount of carbs as the pasta versions. We didn't even miss the pasta, it is that good! That's so great to hear, Melanie! You're going to love making this recipe all fall and winter long!